Part 1 of the award-winning four-issue series about water in the West. Western water once existed in a protected world unto itself, made up of complex laws and regulations, tight political alliances, bureaucracies and massive federal subsidies. But now it is subject to real world forces, making it understandable. 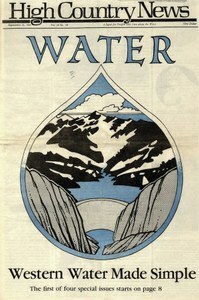 A water deal between California's Imperial Irrigation District and the Metropolitan Water District was to bring water marketing of age. Instead, it has revealed the pitfalls that lie in the path of water marketing.